As Punjab farmers burn down their paddy stubble, Delhi's air quality nosedives. Who is to blame? Since Saturday, 31 October, Delhi's air quality index has seen a dramatic rise of 60-80 points, inching it towards the 'very poor' zone. The reason for this is the uncontrolled annual burning of paddy stubbles by Punjab farmers. The resulting smoke from these fires is so severe that it's been showing up on satellite photos for a couple of years now. The burning of crops in Punjab amounts to about seven million to eight million metric tonnes of plant debris every year. Many farms in Punjab rotate between crops, planting rice in May and wheat in November. To quickly prepare their fields for the wheat crop, they simply burn leftover crop after harvesting rice in a practice that is known as 'paddy stubble burning'. 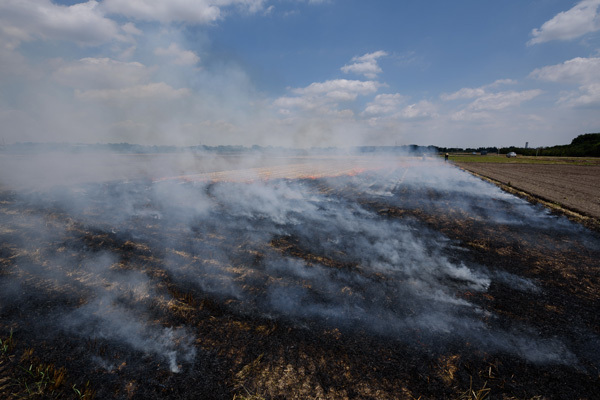 Simple put, stubble burning is the deliberate setting on fire of the straw stubble remains after the harvest is over. According to NASA, "Preparing for planting with fire has the benefit of clearing out some pests that eat crops and turning crop residues from the previous season into fertilizing ash." But the resultant smoke is often many times more dangerous. The smoke that arises from these burnings contains toxic substances, including the fine particular matter PM 2.5 that is used to determine air quality index. In previous years, this rose to levels exceeding 300 - termed "hazardous" for health. It can aggravate heart and lung diseases, especially those with chronic health conditions. Stubble burning isn't the only reason (urban and industrial smog, a still condition and fall in temperatures are others) for the deteriorating conditions in Delhi. But it is the main contributor. The "burning of rice straw remains emits trace gases like carbon dioxide, methane, carbon monoxide, nitrogen oxide, sulfur oxide and large amount of particulate matters, which adversely affect human health as well as the environment," according to environment and science magazine Down To Earth. According to an article in the magazine, India produces 98 million tonnes paddy, second only to China, of which half is used for animal fodder. The rest is burnt in the fields. Farmers prefer setting fire to their paddy fields after the harvesting of the crop to slash labour costs. Back in 2012, United States National Aeronautics and Space Administration (NASA) noticed this and released Moderate Resolution Imaging Spectroradiometer's (MODIS) pictures of a thick blanket of fog, just south of Punjab in the National Capital Region. This image from 29 October, shows the locations of active burning. The burning started on 10 October and peaked around 30 October, a day after the picture was taken. The smoke rises and snakes over Delhi during winters, at a time when the capital is most susceptible to toxic smog. The practice continues year after year in Punjab even though it is illegal. Violators are supposed to be booked under two sections - section 188 (disobedience to order duly promulgated by public servant) of the Indian Penal Code and the Air Prevention and Control of Pollution Act. A slew of other measures have also been implemented to keep the damage under control. Mass awareness programs have taken place in recent years in Punjab and Haryana, billboards and advertisements are seen and heard on television and radio, and even subsidies provided for new machines which can plant new seeds and unearth leftover harvest without creating an environmental hazard. But laws to control the air pollution are rarely enforced. 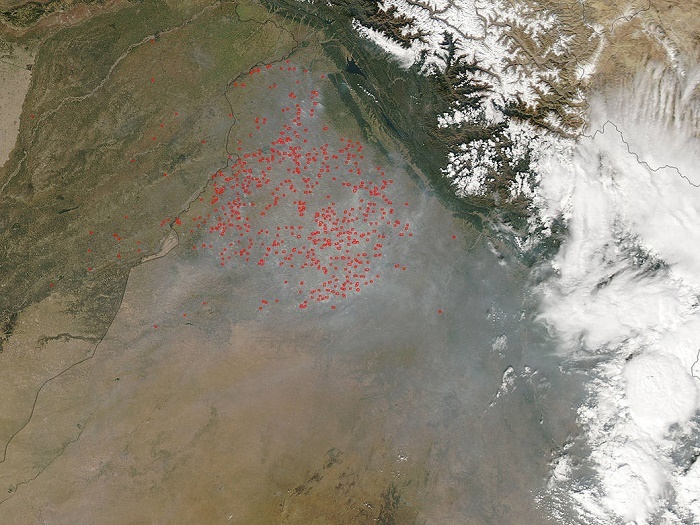 The NASA images above clearly show the government's failure in discouraging the practice of stubble-burning. Also, banning this practice is difficult as it makes life for the poor farmer more difficult. As Gurinderjit Kaur, a lawyer representing the Punjab Pollution Control Board, told India Real Time last year: "Nobody wants to take action against the farmers. They are poor people, so the best way is to educate them." The most disheartening aspect of these fires is the health of the farmers overseeing them. As environment-friendly agriculture takes more effort and time, farmers in Punjab stick to the easy solutions. Hence stubble burning continues unquestioned in the state, despite FIRs and advisories by agricultural officers against the erroneous farmers. 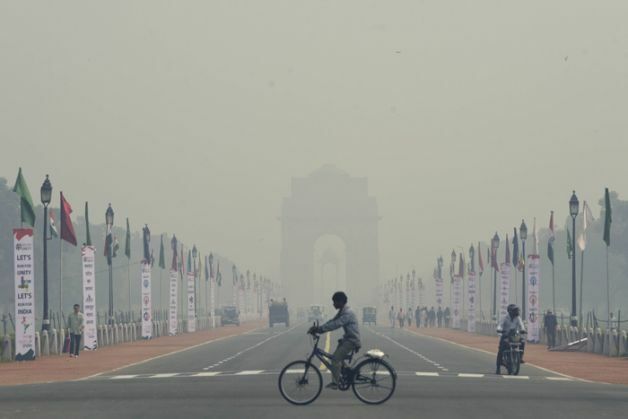 The problem of haze and crop inspired pollution is not unique to India. 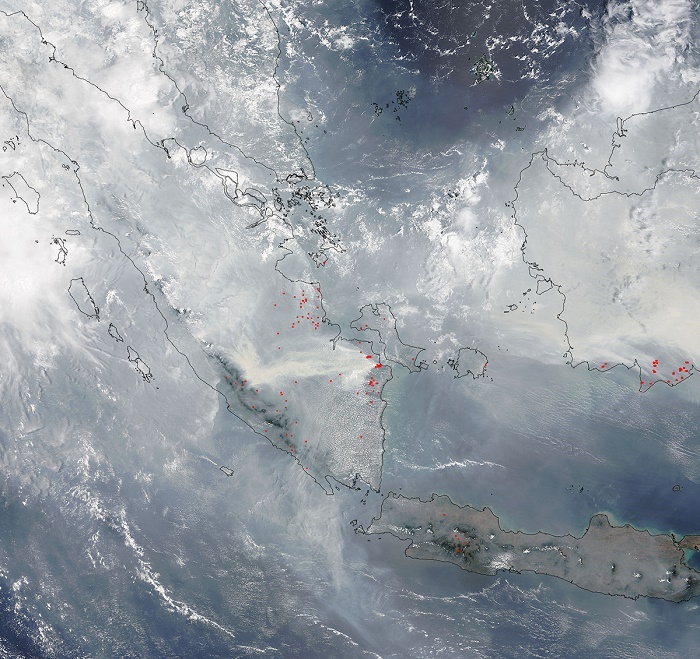 Indonesia, has also been dealing with a similar situation for the past couple of months and coupled with El Nino, this year is turning out to be one of the worst for Indonesia.